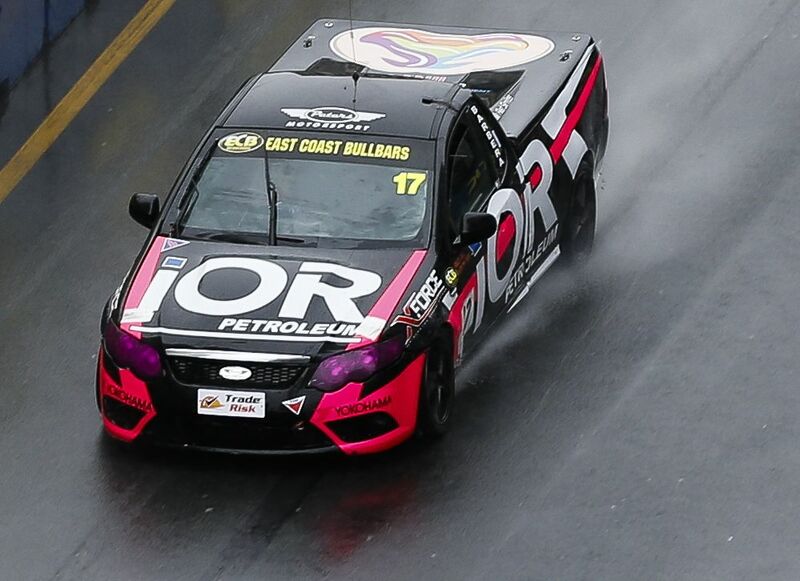 Mason Barbera and Kim Jane shared the first two race victories of Round 5 of the ECB V8 Utes Series in treacherous conditions on the streets of Surfers Paradise. Barbera won the opener and leads the round points ahead of Sunday’s finale, while Jane won the second and still trails Ryal Harris by three points in the title fight. The large volume of standing water on the circuit meant Saturday morning’s opening race started behind the Safety Car. When the race went green, Barbera out-accelerated Jane on the run into the first corner, before applying the pressure to Harris. Eventually, Barbera slipped past Harris with an authoritative move into Turn 11. “After spending a few laps behind Ryal, I worked out there were a few corners where I was stronger under brakes and I was able to make the move stick,” Barbera said. Jane finished third ahead of Matt Spratt and Craig Dontas, while Marcus Zukanovic charged from the rear of the field to 10th. Despite the diabolical track conditions, contact was kept to a minimum – the only incident of note was a collision between Blake Scibberas and Jeremy Gray in the first chicane. The top seven grid positions were inverted for Race 2, and Jane made a blinding start from fifth to move up to third on the opening lap, behind Michael Sieders and Dontas. A mistake from Sieders allowed Jane and Dontas through, and the two Holden drivers enjoyed a close scrap late in the race, with Jane coming out on top. “It was a busy race, that one,” Jane said. “The car was really good in the wet and it helped that I was able to make so many spots at the start. Barbera improved to third place at the chequered flag ahead of Woods and Harris, however the results remain provisional with a number of incidents still under investigation. With the race results and Harris’ three points for taking pole position, Harris and Jane have both scored 97 points so far this weekend. Two of the standout performances of the race came from Queenslander Maxim Erickson and rookie Kyle Austin, who recorded their personal-best finishes in sixth and seventh respectively. “Kyle and I had a great battle, he passed me but I was able to pass him back on the last lap,” Erickson said. “It’s only my second race meeting in V8 Utes so I’m stoked with seventh,” Austin said. Race three will start at 12:35pm at the Vodafone Gold Coast 600.